Does Hardened Scales work with the Hydra´s? 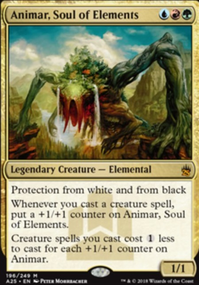 Can I use Chord of Calling for 3 and pull out a card face down for its morph casting cost? Does X add 1 more to the coverted mana cost? 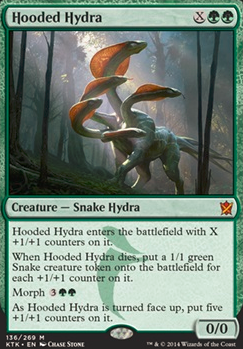 Hooded Hydra enters the battlefield with X +1/+1 counters on it. 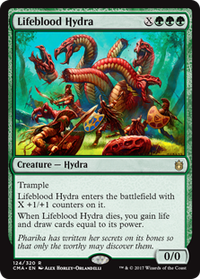 When Hooded Hydra dies, put a 1/1 green Snake creature token onto the battlefield for each +1/+1 counter on it. As Hooded Hydra is turned face up, put five +1/+1 counters on it. Ran the Eldrazi theme for a bit (One or two Months) and test played, I've realized they're to slow for my group so I have decided to leave a few of them in the deck and have gone a different route. Hopefully, you guys notice the changes. There was a lot! Trying to get more token generation in without hurting my deck too much and I'd like to add Concordant Crossroads and Hooded Hydra to the deck. Also, do you guys think I should add Desolation Twin instead of Kozilek, the Great Distortion ? Also, do you guys think I have enough ramp to take out Selvala, Heart of the Wilds for something to make room for other cards? Also Siege Behemoth will be replaced by God-Eternal Rhonas once he comes out. Feedback would be greatly appreciated, guys! Nissa, Voice of Zendikar , Xenagos, the Reveler : Xengos can be particularly good in a token deck because his +1 can get you massive mana. Creakwood Liege , Hooded Hydra , Krenko, Mob Boss : Hooded hydra is a lot better than it seems. It acts like a token/sac bomb in my Prossh, Skyraider of Kher deck (which used to be a Shattergang deck) and can win games when you have cards like Dictate of Erebos on the field. I'm putting Ophiomancer standalone here cause this card is a no-brainer. A snake every upkeep means you can sac during each player's turn and still get the snake back. I hear you with the budget thing, NothingClever. If you can spare the change now, Diabolic Intent is cheeeeap now compared to what it was and will be, and in Ghave (with the cheap 1/1s) it's pretty much might as well be a Demonic Tutor . Worth the buy at this point in time. Altars are expensive too, but what diabolic intent is to demonic tutor in Ghave, a Utopia Mycon is to a Phyrexian Altar . It's a couple bucks, yes, but far cheaper than a phyrexian altar, but once you played with it a few times you'll be very very happy you got it. Turning saproling into mana is just what you need. Gyre Sage is also a must include for Ghave - especially if it's out with a Ivy Lane Denizen , a Juniper Order Ranger , Cathars' Crusade , or any other passive counter adder. I like to have it out with some extra mana, pass the turn, then right before my next turn, create a bunch of saprolings to trigger counters onto it for a big next turn (maybe with 10 Geralf's Messenger triggers. Both Gyre Sage and Utopia Mycon could more justify Exsanguinate in here as well. 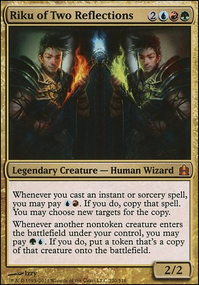 Also, they both make Mirari's Wake and Zendikar Resurgent that much better as you can take the mana doubling even further, leading into a monster turn. I personally would remove Scute Mob for Blade of the Bloodchief as the blade can produce more counters with the combos in here for added fuel to Ghave, and it can go on creatures who's abilities use those counters: Hangarback Walker , Champion of Lambholt , Hooded Hydra , Mycoloth , Fertilid , Gyre Sage , etc........ Far more value. It also makes an Elenda, the Dusk Rose go nuts and provides tons of value in a Ghave. Another very powerful card I've used for Ghave is Glare of Subdual . It has huge interaction potential and controls the board easily with Ghave. Gruul Ragebeast is cool, but I don’t want to force any of my tiny utility creatures to fight when they enter because they’ll just die. Thank you so much for the suggestions and the +1! Your primary goal with this deck is to create a critical mass of big creatures and get some explosive plays. My personal favorite method of making a huge board is creating a massive Master Biomancer with whatever method whether it be from Reyhan, Last of the Abzan triggers or however else and then dropping something like Prime Speaker Zegana drawing a ton of cards or playing a massive Hangarback Walker (which can then be sacrificed by a sac outlet to possibly distribute more counters to Master Biomancer which in turn makes all the thopters MASSIVE). This deck likes explosive draws over incremental draw to really abuse Kydele, Chosen of Kruphix , however the problem arises that the mana she produces is purely colorless. For this exact reason I run both Cascading Cataracts and Crystal Quarry . Now what do you do with the disturbing amount of mana Kydele can produce? 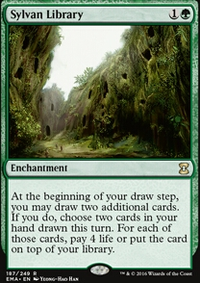 It's as simple as purely giving you more gas to draw more cards after an initial explosive draw or to funnel a ton of mana into a lethal Exsanguinate or to make some rather THICC hydras like Hooded Hydra or Lifeblood Hydra . This seems very fun to play and to play against, take my upvote. What do think about Hooded Hydra? It doubles up as a piñata if you need to swarm the field. CaptSillva, thanks for the suggestions. I'm definitely going to add some of those to my deck as soon as I can get the cards. I always looked at Contagion Engine but never thought it was too great of a card, and then I read it more thoroughly and I understand the appeal. Hooded Hydra and Abzan Ascendancy, although good cards, don't work well with my play-style. I'm trying not to do tokens with this deck and focus more on +1/+1 counters instead. I also had to re-read The Mimeoplasm; he's making the deck as well. Again, I appreciate the feedback.